Leuprolide can be administered intermittently or continuously. Continuously administration of leuprolide is useful in treating endometriosis, leiomyomas and metastatic of prostate cancer. Intermittent administration of leuprolide is useful in infertility treatment. 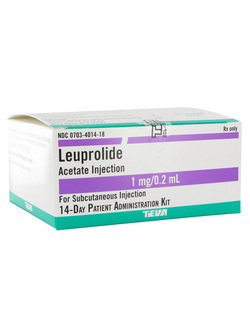 Leuprolide is a well known GnRH agonists. GnRH agonists may include goserelin and naferelin. Leuprolide will bind to the GnRGH receptors in the pituitary gland. Initially there will be an increase in the release of FSH and LH. However, desensitization and down regulation of GnRH receptors may occur due to continuous administration of leuprolide. This will result in the decrease level of the FSH, LH, testosterone and estrogen. Patient with leuprolide may suffer from side effects such as gastrointestinal discomfort, hot flushes and impotence.